Gummibär Sour Gummy Bear Candy - Gummybear International Inc. 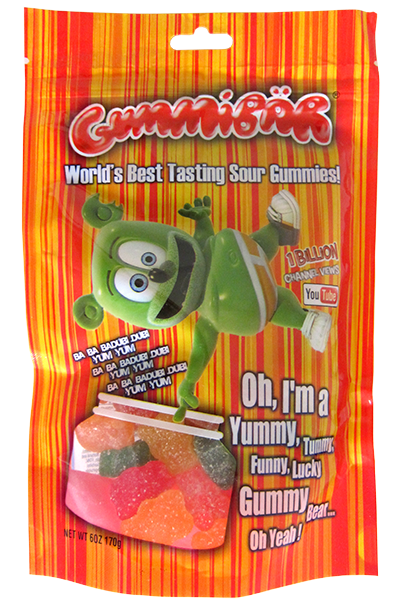 The official Gummibär Sour Gummy Bear Candy has arrived in the Gummy Bear Shop! These tasty, yummy sour gummies are Gummibär approved! These sour gummy candies are fat free and gluten free. Ingredients: Corn Syrup, Sugar, Sugar (from Beets), Gelatin, Citric Acid, Lactic Acid, Sorbitol, Natural and Artifical Flavors, Pectin, Titanium Dioxide, FD&C Yellow #5, Yellow #6, Red #40, Blue#1, Sorbitol (Derived From Fruits and Vegetables), Vegetable Oil (Coconut), Carnauba Wax (For Anti-sticking). Manufactured in a facility that processes products containing soy, dairy, egg, wheat, peanut and tree-nut elements.